The Year was 1913 and the clouds of war were gathering over Europe as four well-known gentlemen, all residents of Shevington and living locally in Gathurst Lane, were finalising their plans to form a new golf club. It was to be situated in the Parish of Shevington and would be called: “Gathurst Golf Club”. These four far-seeing pioneers, who can only be described as the clubs Founding Fathers, were: Alfred Broach – Bank manager William J Griffin – Wigan & St Helens Businessman Mathew Taylor – Local Factory Manager, and, E B Naylor – Lecturer in Chemistry. Encouraged by an increasing wave of enthusiasm for the new club, the four men convened a meeting that was to take place on 18th December 1913 but unfortunately the venue is unknown. As more and more people signalled their intention to attend, it was decided that it would now constitute the First Annual General Meeting of Gathurst Golf Club. With Mr W J Griffin presiding, an agenda was agreed as follows: 1 To enrol everyone present as members 2 Election of officers for 1914 3 Signature of Agreement of Leasehold 4 Fixing of subscriptions for 1914. As a result of that meeting, Mr W J Griffin was elected to be the first Captain of the Club with Mr. J D Reid as Vice-Captain. Mr M Taylor was invited to be President, possibly by virtue of his age; he was at the time quite an elderly gentleman. Mr J Hancock the new Honorary Secretary / Treasurer, was to keep a register of those present at that inaugural meeting and the names were as follows: Mr W J Griffin, Mr J D Reid, Mr M Taylor, Mr A Broach, Mr J Hancock, and Messrs Caruthers, Ellison, Hilton, Johnson, Johnson Jnr, Morris, Naylor, Pierspoint, Pennington and Shaw, the fifteen men who could proudly claim that they were the founding members. 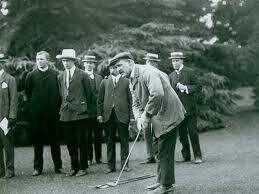 The course was opened for play on 23rd December 1913, just five days after the first Annual General Meeting and the signing of the Lease Agreement. Annual Subscriptions had been fixed at £1.5s.0d. GATHURST GOLF CLUB WAS HERE TO STAY.